Home AP State Articles General Govt.of India Schemes TG State Vidya Lakshmi Web Portal for Students seeking Educational Loans,How to apply? 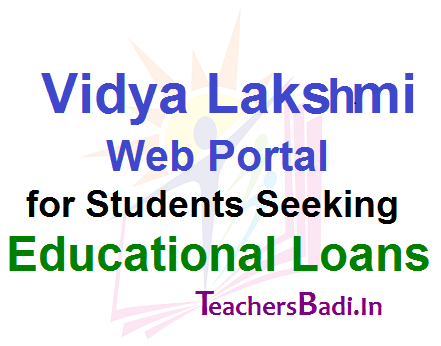 Vidya Lakshmi Web Portal for Students seeking Educational Loans,How to apply? VidyaLakshmi Web Portal Launched for Students Seeking Educational Loans, How to apply? How to apply for #Vidyalakshmi Education Loan Scheme/ How to Apply Education Loan in Vidyalakshmi Portal/Vidya Lakshmi Portal for #EducationalLoans & Scholarships/Pradhan Mantri Vidya Lakshmi Karyakram - Towards a Bright Future ... A Web-Based Portal VIZ. Vidya Lakshmi (www.vidyalakshmi.co.in) Launched for Students Seeking Educational Loans; First Portal of Its Kind Providing Single Window for Students to Access Information and Make Application for Educational Loans Provided by Banks as well as for Government Scholarships. A fully IT based Student Financial Aid Authority has been proposed through the 'Pradhan Mantri Vidya Lakshmi Karyakram', to administer and monitor Scholarship as well Educational Loan Schemes, with a view to enable all poor and middle class students to pursue higher education of their choice without any constraint of funds. Vidya Lakshmi Portal is a first of its kind portal for students seeking Education Loan. It provides single window electronic platform for students to access information and prepares applications for Educational Loans and Government Scholarships. Vidya Lakshmi is a first of its kind portal for students seeking Education Loan. This portal has been developed under the guidance of Department of Financial Services, (Ministry of Finance) , Department of Higher Education (Ministry of Human Resource Development) and Indian Banks Association (IBA).The portal has been developed and being maintained by NSDL e-Governance Infrastructure Limited. Students can view, apply and track the education loan applications to banks anytime, anywhere by accessing the portal. The portal also provides linkages to National Scholarship Portal. A web-based portal viz. Vidya Lakshmi (www.vidyalakshmi.co.in) was launched on the occasion of Independence Day i.e. 15th August, 2015 for the benefit of students seeking Educational Loans. The Portal has been developed and maintained by NSDL e-Governance Infrastructure Limited (NSDL e-Gov) under the guidance of Department of Financial Services, Ministry of Finance, Department of Higher Education, Ministry of Human Resource Development and Indian Banks’ Association (IBA). Vidya Lakshmi Portal is a first of its kind portal providing single window for Students to access information and make application for Educational Loans provided by Banks as also Government Scholarships. The Portal has the following features.. So far, 13 Banks have registered 22 Educational Loan Schemes on the Vidya Lakshmi Portal and 5 Banks viz; SBI, IDBI Bank, Bank of India, Canara Bank and Union Bank of India have integrated their system with the Portal for providing loan processing status to students. This initiative aims to bring on board all Banks providing Educational Loans. It is expected that students throughout the country will be benefited by this initiative of the Government by making available a single window for access to various Educational Loan Schemes of all Banks. Vidya Lakshmi Portal provides single window for Students to access information about various loan schemes provided by banks and make applications for Educational Loans. If you want to apply for education loan on Vidya Lakshmi portal, you must register on portal. Please provide essential details as mentioned in registration form. Email ID- Enter a valid email ID. Email ID will not be allowed to change. All necessary communications will be sent on this email ID. The applicant must register and login to Vidya Lakshmi Portal and then fill-up the Common Education Loan Application Form (CELAF) by providing all the necessary details. CELAF is a single form which students can fill to apply for Educational Loan to multiple banks/schemes. This form is prescribed by Indian Banks Association (IBA) and accepted by all banks. It is provided on Vidya Lakshmi Portal. After filling the form, the applicant can search for Educational Loan and APPLY as per his/her needs, eligibility and convenience. Alternatively, the applicant can also search for Educational Loan after login and apply for the suitable Educational Loan by filling the CELAF. A student can apply to a maximum of three Banks through Vidya Lakshmi Portal using CELAF. Name - Please enter student name as mentioned on 10th standard mark sheet or the mark sheet attached with your loan application. Mobile Number - Enter a valid mobile number. Student can provide mobile number of parent/guardian. Email ID - Enter a valid email ID. Email ID is not allowed to be changed later. All necessary communications will be sent on this email ID. 1. What are the features of Vidya Lakshmi Portal? 2. How can I apply for Educational loan through Vidya Lakshmi? The applicant must register and login to Vidya Lakshmi portal and then fill-up the Common Education Loan Application Form (CELAF) by providing all the necessary details. After filling the form, the applicant can search for Educational Loan and APPLY as per his/her needs, eligibility and convenience. Alternatively, the applicant can also search for Educational Loan after login and apply for the suitable Educational Loan by filling the CELAF. 3. What is Common Educational Loan Application Form (CELAF)? The Common Educational Loan Application Form is the single form which students can fill to apply for Educational Loan to multiple banks / schemes. CELAF is the application form prescribed by Indian Banks Association (IBA) and accepted by all banks. This form is provided on Vidya Lakshmi portal to apply for Educational loan. 4. What is Sign up? Students are required to complete sign up process to register on Vidya Lakshmi portal. Only Students who have completed "Sign up" / "Registration" process can apply for educational loan through Vidya Lakshmi portal. 5. What if I forget password of my Login ID? You can click on Forgot password option provided on the Login page of Vidya Lakshmi portal and you will be asked to provide your registered e-mail address. Vidya Lakshmi portal will send a system generated password through an e-mail. 6. How will I know once Education Loan is approved? The Bank will update the status of the application on Vidya Lakshmi portal. Students can view the status of the application on the applicant's dashboard on the portal. 7. Why is my loan application rejected? You may not be eligible as per the norms laid down by the selected banks. Please contact the selected banks for more details. 8. What is on hold status of Loan application? The Bank will mark the loan application status to on hold when the bank requires some further information or documents to be submitted by the student. The requirement will be indicated in the Remarks column and Student can check the same in the dashboard. 9. How is the money/educational loan disbursed? Approved Educational Loan of an applicant will be disbursed directly by the bank outside the Vidya Lakshmi Portal. To know more, contact the bank you have selected. 10. Which are the banks I can apply for Educational loan through Vidya Lakshmi portal? To view the list of registered banks on Vidya Lakshmi, Please see at the bottom of Home page. 11. How many applications for Educational Loan can be submitted by a student? 12. What is rate of interest for the Educational loan? The interest rate varies from bank to bank and scheme to scheme. Therefore, the applicant/student is requested to check the same on Loan Search page after login.